Although spiders might not be the creatures that first come to mind when you think of burrowing, several types of the arthropods regularly engage in the digging behavior. Wolf spiders and trapdoor spiders are just two examples of arachnids that spend much of their time in the ground. Many spiders that burrow are sit-and-wait predators, meaning they wait for prey to move past the entrances of their burrows rather than actively pursuing them. When they notice that targeted prey animals are nearby, they launch surprise attacks on them. Arachnids such as trapdoor spiders (family Ctenizidae), tarantulas (family Theraphosidae) and wolf spiders (family Lycosidae) all remain in their burrows while patiently awaiting their next meals getting closer. Mouse spiders (family Actinopodidae) usually sit and wait, although they sometimes venture out to search for prey. While some burrowing spiders such as tarantulas are adept at digging their own holes, others are not. Long-legged cellar spiders (family Pholcidae) spend time in burrows, but they let other animals do the dirty work for them, especially rodents. Desert grass spiders (Agelenopsis aperta), on the other hand, are frequently found close to burrows made by rodents, but mostly because their webs, which are usually located in high grass, dangle down into them. Spiders exist both in diurnal and nocturnal varieties. Some burrowing spiders prefer to wait for unsuspecting prey -- from the comfort of their burrows -- at night. 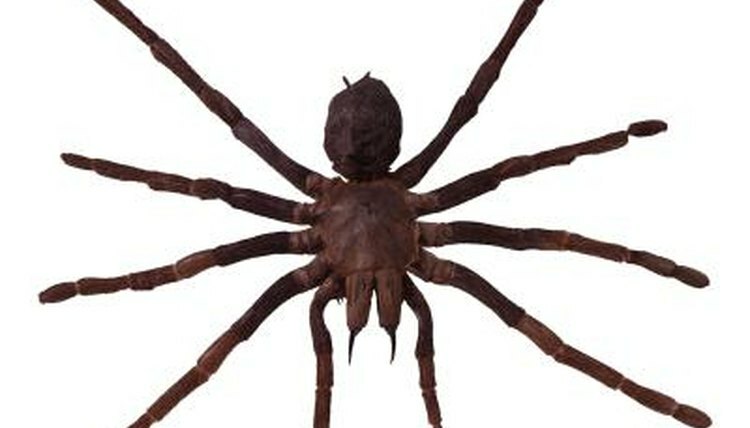 Tarantulas are nocturnal creatures and are part of this category. Trapdoor spiders too are nocturnal. Burrowing wolf spiders, on the other hand, tend to be diurnal. Burrowing spiders often seize their desired prey with the use of handy silk. Trapdoor spiders, for one, fit this description. These arachnids' burrows are topped with the "trap doors" of their naming. They use their own silk to produce these doors, which they handily conceal with dirt. One edge of the door is attached, while the spider securely grabs the other. When prey animals approach, these fast-acting spiders immediately force their bodies upward to retrieve them. Funnel web spiders (genus Hadronyche) also employ silk to capture prey. They stick threads of silk out from the entry points of their burrows. When prey animals make physical contact with the threads -- and therefore trip on them -- funnel web spiders immediately swoop in for dinnertime. What Are the Dangers of a Mexican Blonde Tarantula? How Does a Spider Sleep? Where Do Monkey-Faced Spiders Live?